This is an edition of G (7) folios + one artist proof. 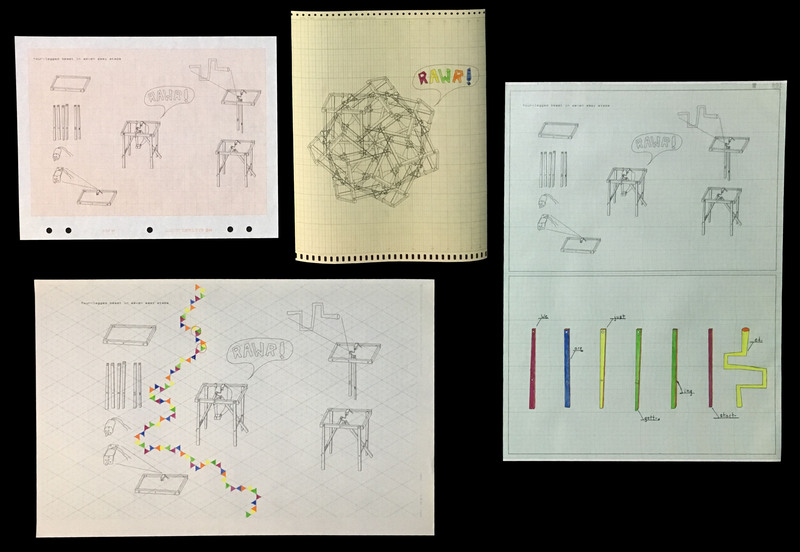 Each folio contains four drawings: a, b, c, d. The drawings are made with a combination of machine-assisted (pen plotter) and manual techniques, and each is slightly different from the others. Each drawing is done on a different style of vintage graph paper using technical pens and watercolors. Drawings were made in October and November 2016 in Memphis, Tennessee. Only one of the folios is shown here. All are similar, but the details (path of the triangles in drawing B, for example) are slightly different. Folios a and b are gone. Remaining folios will be sold in order: c, d, e, f, g. Artist proof not for sale -- I want one! I am also making a more affordable unlimited edition of the primary design: Drawing e.
foal folio (drawings a, b, c, d): $600 for the set, including USA shipping (please contact me for international shipping rates). Drawing e: $25, including USA shipping (please contact me for international shipping rates). Thanks so much to friends and family, old and new, who have been encouraging me these last few months. Together we are mighty!